Your private day trip offers a choice of just having a driver for the day or having a driver and guide, too. The Driver Only option gives you the freedom to explore Segovia at your own pace and see the sights that interest you most, with convenient transport from A to B. By upgrading to include a guide, you’ll enjoy a flexible tour of the city with transport to each of the sites. Read on to understand a typical Driver and Guide tour! Start with a pickup from your Madrid hotel, and then relax on the journey to the famous UNESCO World Heritage site of Segovia. This ancient Roman city enjoys an idyllic setting between the rivers Eresma and Clamores, bordered by the imposing Sierra de Guadarrama mountain range. 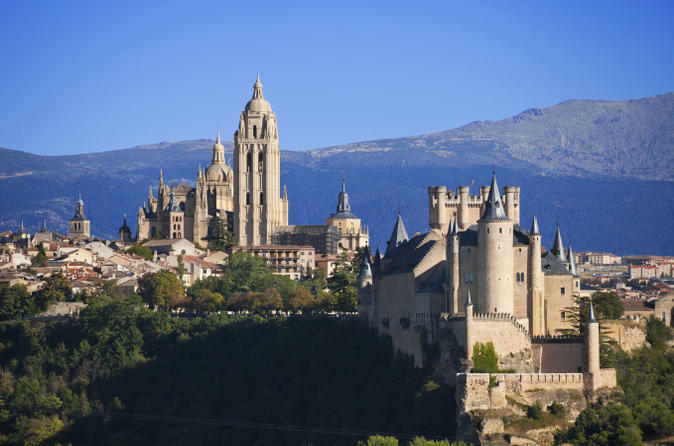 First, take a look at impressive Segovia Cathedral, fondly known as the ‘lady of cathedrals’ for its elegance. Built in late-Gothic style, this Roman Catholic church sits in the center of the city and boasts a fascinating history. Then, continue with your guide to admire the impressive Alcázar Castle, one of the most remarkable castle-palaces in the country. If you want a break from exploring, enjoy a rest in the shade in Segovia’s grand central square. Here, the hustle and bustle of daily life continues as it has done for centuries, and you can soak up the atmosphere whilst enjoying the fine views. One of the benefits of a private tour is that the itinerary is relatively flexible, and you can take breaks or perhaps see other attractions, as you wish. Simply discuss with your guide on the day. As you continue to discover Segovia’s many wonders, take time to marvel at the city’s enormous aqueduct, one of the finest Roman monuments still to be standing on the Iberian Peninsula. The Aqueduct of Segovia’s precise construction date remains a mystery, though it’s thought to date back as far as the 1st century. The structure still carries water from the Fuente Fría River into the city to this day! Follow your knowledgeable guide through the city, and ask for tips for the best places to stop for lunch, perhaps enjoying local delicacies such as suckling pig or delicious Castilian soup. Any meals and drinks are at your own expense. At the end of your tour, say goodbye to your guide and travel back to your hotel in Madrid with your driver.